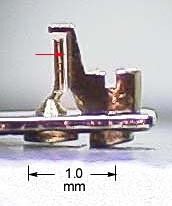 The regulator is shown inverted in this photograph, the curb pin on the left, the boot on the right. The balance spring passes through the space between the two (arrow), which determines the “effective” length (as opposed to actually total physical length) of the spring. This affects the rate of the watch. A shorter spring speeds up the watch, a longer one slows it down.